Working with state and local governments, as well as a wide variety of non-governmental agencies, Michigan amateurs participate in a wide range of public service and emergency preparedness activities. This report outlines the efforts of the 2010 calendar year. There are two primary programs, the Amateur Radio Emergency Services (ARES) and the National Traffic System (NTS). ARES provides "feet on the ground" for various events and incidents, while NTS provides a communications infrastructure that moves formal messages acroos the state and across the nation. SKYWARN members provide ground weather observations to their local jurisdictions and to the National Weather Service. SKYWARN member do not have to be ARES members, but almost always are, and most counties run SKYWARN programs as part of their ARES programs. SKYWARN observers are trained by the National Weather Service. Together, Michigan amateurs reported over 85,000 volunteer hours during 2010 representing a value of over $1.5 million. 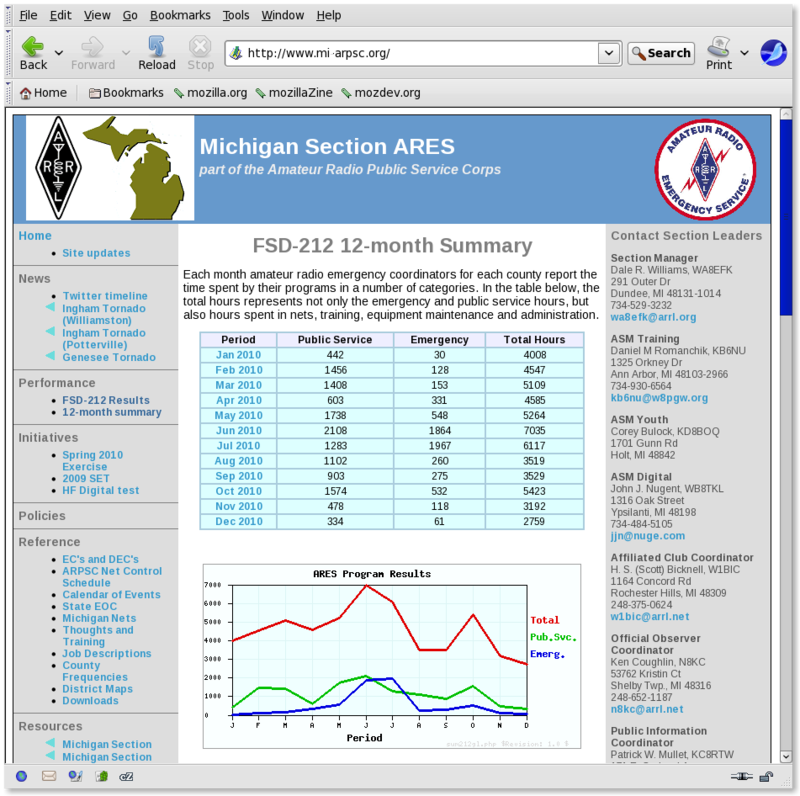 Michigan ARES programs reported 55,087 hours in 2010, 7035 of them occuring in June. 2010 was a very light year for damaging weather. In 2009, when the state experienced much severe weather, more than twice that effort was reported in May alone, with all the late spring/early summer months exceeding June of 2010. Michigan's National Traffic System consists of amateurs who send messages (called "traffic") around the Section and around the nation. These amateurs are organized into a group of on the air nets that meet frequently with the intent of passing messages. These are the "unsung heros" of ARPSC; many practice their skill every day, but they operate behind the scene, out of the eye of the served agencies and the public. 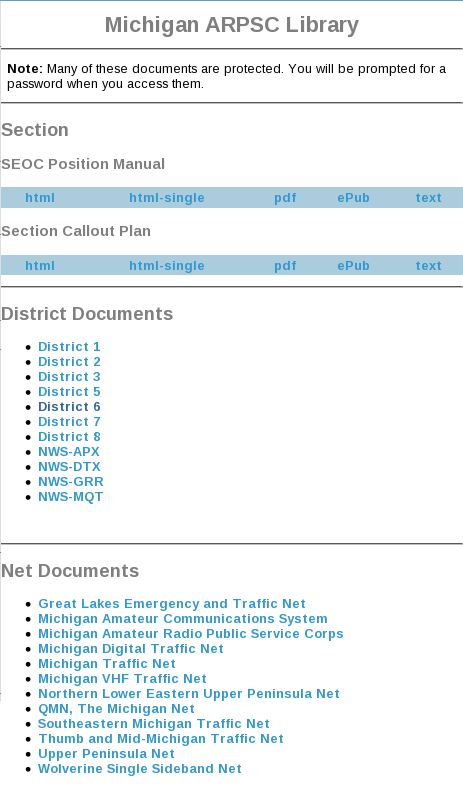 Detailed reports for the most recent month are available at http://www.mi-nts.org/netreport.php. Links on the page allow for viewing of previous reports or individual net history. The bulk of the traffic is passed through ten affiliated nets. Each net has an appointed net manager, responsible for arranging net controls and liaisons to other nets, and for reporting monthly to the Section Traffic Manager. PSHR reporting for 2010 has been relatively flat across the year. The summer months tend to be higher due to bad weather and various public service events. Stations handling traffic are encouraged to submit Station Activity Reports (SAR) indicating the amount of traffic handled. 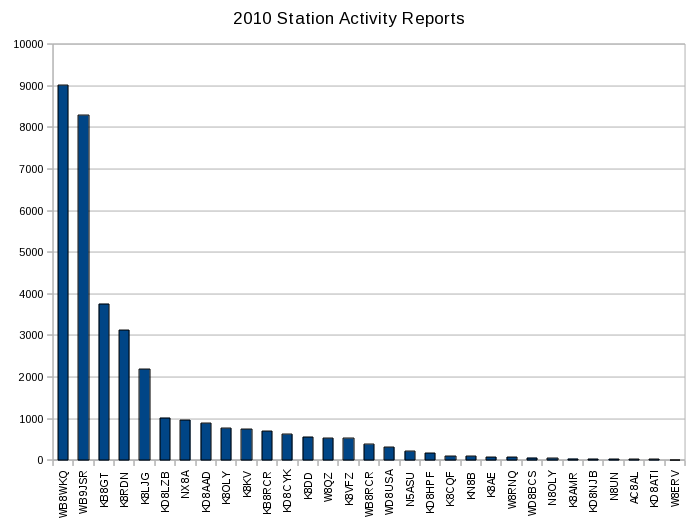 Only 31 stations reported during 2010. Since most of the traffic is handled by relatively few stations, and those stations tend to be the stations that report, the traffic totals reported are quite high. Stations handling a lot of traffic tend to be those stations that act as liaisons to Region or Area nets, so even though the number of stations reporting is quite small, the amount of traffic reported is considerably larger than the totals from net reports, which include only messages passed on Michigan nets. For 2010, Michigan stations individually reported 35,423 messages. 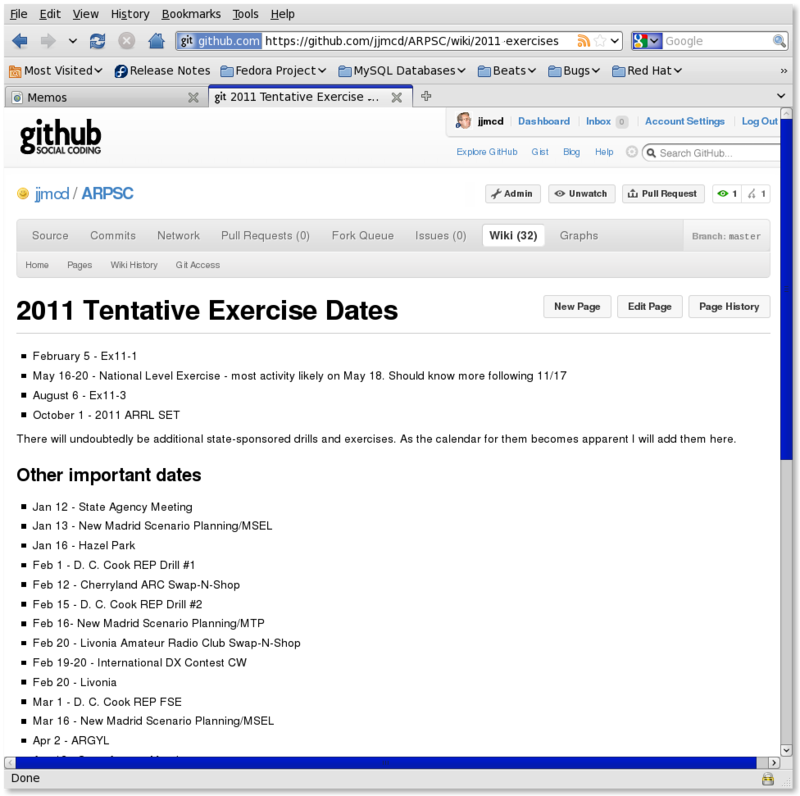 The screenshot below shows an example page from the mi-arpsc site. The Section Emergency Coordinator also maintains a blog, however this mode has proven to be of limited utility. Much of the information that the SEC must communicate with ARPSC members has to do with the emergency planning of the State of Michigan. This information should not be widely distributed, and blogs are easily located by search engines. As a result, blog entries have been relatively sparse. The section maintains two microblogging accounts; miarpsc on identi.ca and mi_arpsc on twitter.com. "Tweets" or "dents" are sent to these sites periodically to remind followers of various upcoming events. Both sites get exactly the same feed. 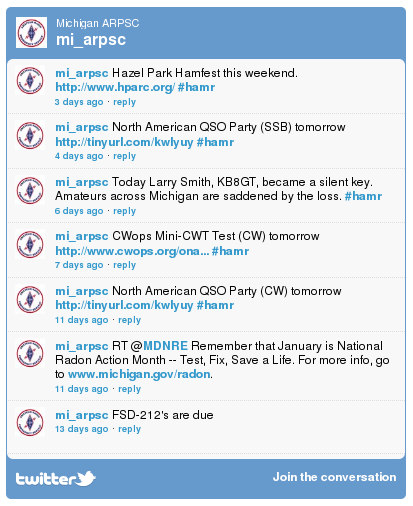 There is also a page on the mi-arpsc web site, http://www.mi-arpsc.org/arpsc_tweets.php where those who do not follow either microblogging site may view the feed. Meetings within smaller groups are often held remotely. Simple phone conferences are frequently used. In addition, GoTo Meeting, and more recently, Vyew allow documents to be shared online during these phone conferences. In addition to numerous local incidents, in 2010 there were two incidents that caused at least partial activation of the State EOC. In June, a tornado went through Monroe county causing significant damage to the Village of Dundee. In addition, the tornado damaged the E. Fermi II nuclear power plant which caused activation of the SEOC. No release occurred and the public was not endangered. ARES programs in Monroe and Wayne counties responded. In July, a pipeline in Battle Creek operated by Enbridge Inc. ruptured, spilling crude oil into the Kalamazoo River. ARES programs from Calhoun, Allegan and Kalamazoo counties responded. In neither case was the station at the State EOC activated, however in both cases the SEC monitored the progress of the event via the State's Critical Incident Management System and was in frequent telephone and radio contact with the local programs. The interface between ARES and NTS has not been as effective as it might be. Two functional drills were held in 2010, both with the intention of helping to develop that interface. The first was held April 10. In this exercise, detailed instructions were provided to the leadership of ARES and NTS as to expectations, circuits to be used, net schedules, etc. Although there were some issues, the programs performed reasonably well. The second was held October 2. The scenario and overall plan was the same as the April drill, however, the Emergency Coordinators and Net Managers were given much less detail. That exercise made it clear that much more practice is needed in the NTS/ARES interface. Emergency Coordinators have consistently asked for more statewide drills, with the most common request being for four per year. There is a major statewide exercise coming up in mid-year. This is being held in conjunction with a National Level Exercise (NLE) around the New Madrid fault called NM11. This results in a fairly aggressive schedule for 2011. Note that a number of the exercises are not statewide, but rather to exercise specific skills within a limited group. Rationale: The section has no experience with the FEMA process for developing and evaluating exercises. This is intended to pilot that process. Expect a simple drill but with most of the HSEEP deliverables. Rationale: Practice skills for NM11. Rationale: Work out procedures for NM11. Validate relays from SEOC to WB9JSR to NTSD to Indiana key station to Indiana SEOC. Rationale: Work out procedures for NM11. Validate relays from SEOC to MARS to Indiana MARS rep to Indiana SEOC. Rationale: Test run procedures for moving messages over NTSD from the SEOC to the SEOC of Indiana in preparation for NM11. Rationale: Test run procedures for moving messages over MARS digital from the SEOC to the SEOC of Indiana in preparation for NM11. Rationale: Involve all agencies in an exercise that involves several other states. In 2010, the Section Emergency Coordinator attended two conferences sponsored by the Michigan State Police. Several Emergency Coordinators also attended these conferences. In May, the SEC attended the State Homeland Security Conference in Grand Rapids. Topics covered included terrorism, cyber security, use of social media, and interoperable communications. In November, the SEC was privileged to speak at the State Interoperable Communications Conference in Traverse City. This conference was attended by a large number of Emergency Management Coordinators from across the state as well as other first responders. In late 2009, the SEC participated with other State Agencies in the development of the State Homeland Security Strategy. In 2010 that strategy was approved, and a number of objective coordinators were appointed to focus on the various elements of the strategy. Enhance, implement, and sustain homeland security programs. Annually identify planning needs to improve capabilities and address changing conditions by August 30. The Section has committed to contribute to the State's progress against this objective by preparing a number of planning documents. Some of these documents have been completed, and a number are scheduled for 2011. Because many of these documents contain sensitive information, the SEC has developed a "library" on the website where these documents can be easily found and, if necessary, password protected. DECs and Net Managers have been given password access, and it is anticipated that most ECs will also require access. Each program within the Section has a dedicated area within the library. It is anticipated that documents within the library will be available in a number of formats; html for online access, pdf for printed output, ePub for portable devices, and plain text for packet BBSs and similar low-bandwidth devices.